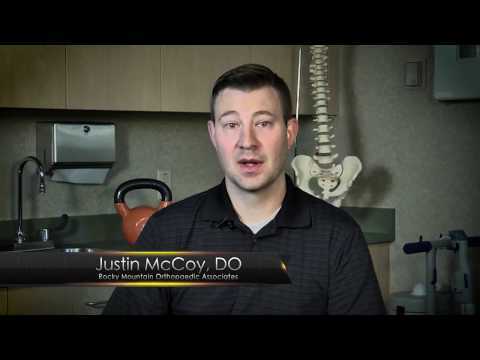 As a Primary Care Sports Medicine Physician, Dr. Justin McCoy specializes in the prevention, diagnosis and non-surgical treatment of orthopaedic and sports related injuries. fulfilling lifestyle as quickly and as safely as possible. Dr. McCoy grew up in Washington state where he developed a love of sports and the outdoors. He has a love of all sports but football is his favorite to watch, as well as his favorite to play when he gets the chance. He enjoys playing the guitar and other musical instruments as well as spending time playing yard and board games with his family and friends. Dr. McCoy met his wife as a freshman in college and she has been a huge support throughout his medical training and career; they have five children who keep them busy the majority of the time. Very satisfied with the kindness and friendliness with of all staff I dealt with. Dr. McCoy explained everything completely before, during and after the procedure. Thank you for the great care. After Dr. McCoy drained the fluid from my knees, they no longer hurt!!! I really appreciate all of the excellent care I received from Dr. McCoy.